J. & E. Stevens Company of Cromwell, Connecticut specialized in the manufacture of cast iron toys beginning in 1869. The iron shortage of World War II effectively ended their production and the company was sold in 1950. 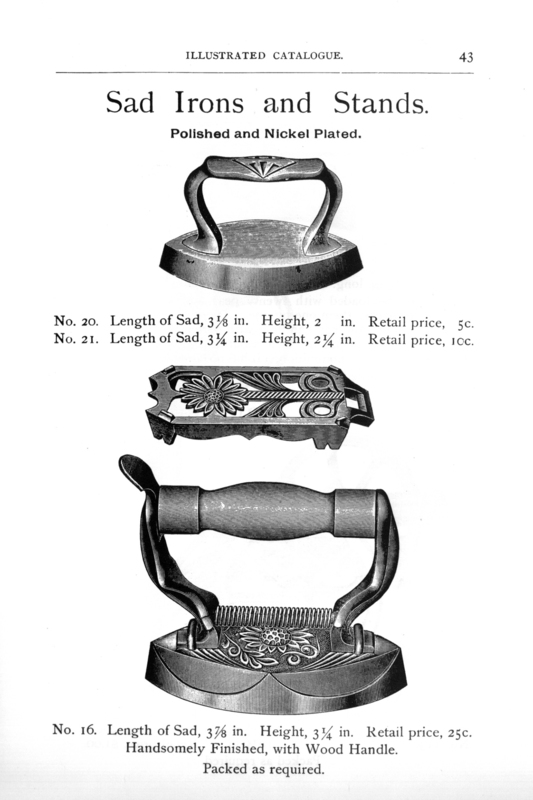 Stevens was best known for toy mechanical banks and cap pistols but also made wheeled toys, toy ranges and a few little sadirons with companion trivets. Their older toys are now highly collectible with some of the more desirable castings selling in the thousands of dollars. For years I’ve been an admirer of the J. 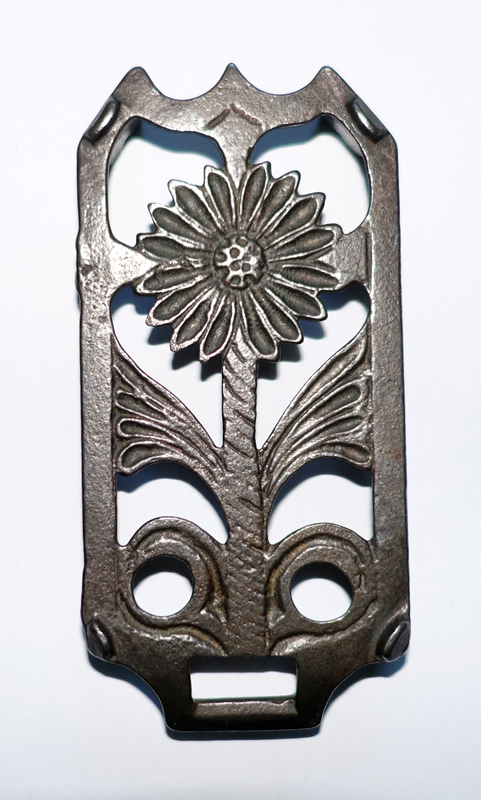 & E. Stevens Company sunflower iron and trivet. It’s a beautifully designed and relatively rare child’s set. The image above (click to enlarge) appears on p.43 of their 1906 illustrated Catalog No. H-2. These items are of cast iron. Nickel-plating was an optional finish. I sold my heavy A & W Manufacturing Company 3-sadiron heater for $300 at the August 2016 PITCA Convention in Columbus, Ohio. The next day I bought this perfect condition Stevens sunflower trivet during our club’s Buy & Sell, using the proceeds from the sadiron heater. Not only was this a long anticipated purchase but my car was much lighter on the trip home to Florida. Now begins my search for the Stevens sunflower sadiron! This trivet appeared on p.240 of Judy Politzer’s first book “Tuesday’s Children” in 1977. By the time her second book was published Politzer had found the companion sunflower iron; she featured the lovely pair on her cover of “Early Tuesday Morning” in 1986. Updated information on the trivet and iron appears on p.131. Below are three different views of the trivet. 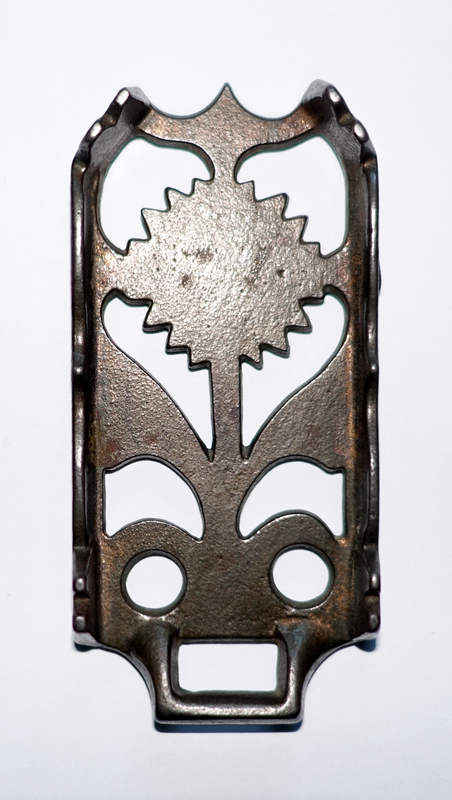 There are 4 small iron guides at the top edges to contain the little sadiron. Note also the 2 gate marks (casting marks) along one side. There is no signature on the reverse. This entry was posted on August 16, 2016 by Lynn Rosack in Foundries & Distributors, Toy Trivets & Irons and tagged cast iron, J. & E. Stevens Company, Judy Politzer, sunflower, Tuesday's Children.